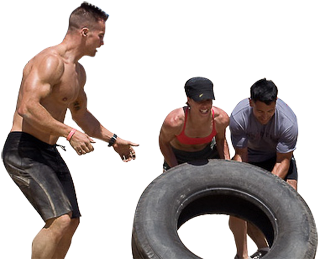 Infinity Health and Wellness Center: Crossfit: Why You Should! CrossFit is the hottest workout trend right now, and it’s really all that it’s hyped up to be. Here are 5 reasons why you should try it. 1. It’s so much fun…really, it is!!!! I was an endurance athlete and ultimately, became a bored endurance athlete. I wanted something that didn’t require hours upon hours of training with little payoff. When a friend suggested I try CrossFit, I thought why not? CrossFit workouts of the day, called WODs, are constantly varied and include combinations of aerobic exercise, strength training and gymnastics. WODs are short, intense and best of all—fun. After you’ve recovered from the shock and awe of what you’ve just accomplished, you realize how enjoyable it was. If you don’t trust me, ask anyone you know who does CrossFit if they think it’s fun. 2. You’ll get fitter, faster. CrossFit is based on constantly varied, high-intensity interval training (HIIT), which means you get more physiological benefits in less time compared doing one type of exercise at a low or moderate intensity, like going on a 5-6 mile jog 5 days a week. Research shows that interval training (higher efforts combined with active rest) is more effective than low or moderate intensity workouts for boosting your metabolism and transforming your body from flab to fab. And because muscles continually adapt to an exercise load, switching up what you do is key to keep gaining additional fitness benefits. But don’t let the word “intense” scare you: WODs are scaled to your current conditioning so you’ll be just fine from Day 1. Unlike other exercise programs designed to get you pin-thin, CrossFit is designed to help you create a beautiful, lean physique that not only looks great but also allows you to do things you never thought you could. You’ll have strength to do lots of pull-ups and push-ups, stamina to run for miles as well as better balance, agility and coordination. You’ll feel confident about yourself and how strong and fit you feel. If you do CrossFit and eat right you’ll lose fat and get stronger at the same time. Since I’ve been going to my CrossFit gym (called box), Tamalpais CrossFit in Marin County, CA, I have a whole new second family. Cross fit is often referred to as a cult because Cross Fitters are close-knit and they often socialize together. CrossFit boxes are as much about community as they are a place to workout. Egos are checked at the door; everyone is supportive on each other and will help you reach your personal goals. The other great thing is that no matter where you are in the world, you’ll be welcome at other CrossFit facilities. I’ve been to them in New Zealand, NY, MI, AZ, IL, MA, and have felt welcome everywhere. Another added bonus: Single CrossFitters often find like-minded mates to date and even my niece, met her future husband at CrossFit LA. To find a local box in your area, use this CrossFit locator. 5. CrossFit will make you a better person. Go ahead, give it a try….then email us to let us know what you think.